Roles are an important way to customize the experience for each of the users associated to your account. By default you are given 3 roles but these can be customized or you can create custom roles that fit your team best. To access the roles page, you can click on the "Roles" tab in your admin. 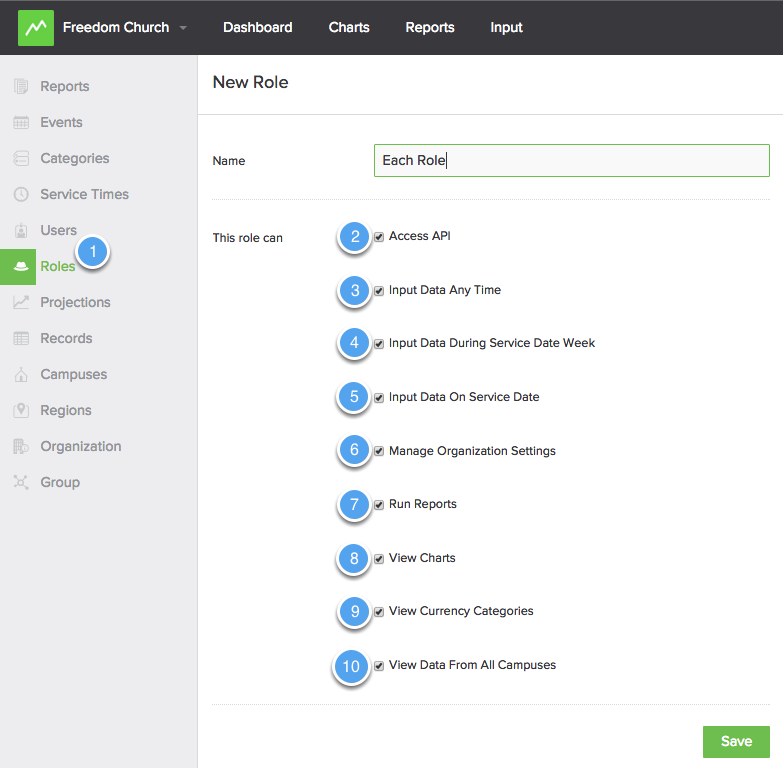 "Input Data at Any Time" will allow a user to input data into Church Metrics at any time. They will have no restrictions on the "input" screen. "Input Data on Service Date Week" is the most restrictive input permission and will only allow you to input data on that service day. "Input Data on Service Date" will allow a user to input data for any service this week. To allow a user to only input data for this week you will want to check this and leave "Input Data at Any Time" blank. "Manage Organization Settings" will allow a user to have access to the Admin. They will be able to add users, edit roles, create reports, and change other organizational settings. "Run Reports" will allow users to run reports. They will not however be able to create new reports. Only those with "Manage Organizational Settings" will be able to create new reports. "View Charts" will allow users to view the "Reports" page and compare campus data. "View Currency Categories" will allow users to add and view currency data. If left blank they will not be able to input or see currency data. "View Data From All Campuses" will allow users to see the data from all campuses regardless of what campus they are associated to.